How does a populist movement deal with the general population? OPEN DOOR: 'You treat the mentally challenged the way society should treat them,' said Councilmember Gary Wysocky to Occupy Santa Rosa organizers at an 'urgency meeting' last week. 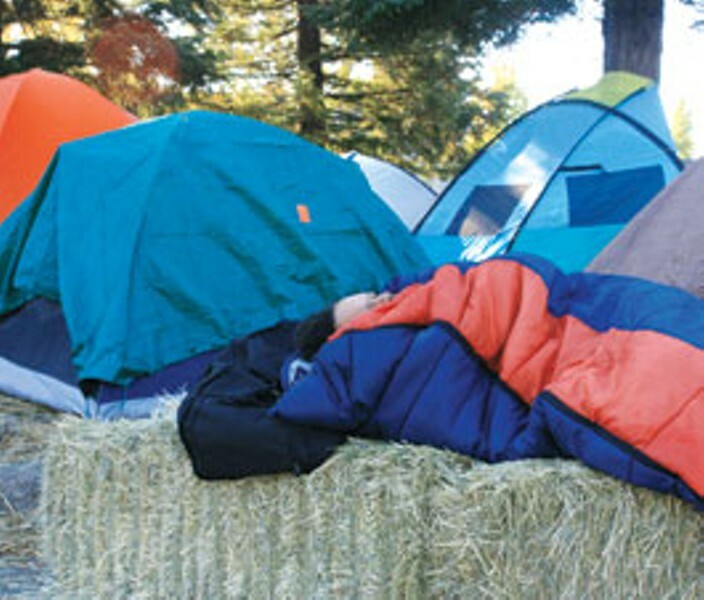 In the days since the Santa Rosa City Council approved a permitting process allowing tents to stay up at City Hall for at least another two weeks, the mood around the Occupy Santa Rosa camp has been jubilant. But with that jubilation comes the growing reality of dealing with the homeless and mentally ill who have been drawn to the encampment, some by the opportunity to participate in the movement, and others for free food, social opportunity and safety in numbers. This community has been "warmly welcomed" by the occupiers, says "Joyce," a 61-year-old homeless woman who did not want her real name published. Currently residing at a shelter for adults in Santa Rosa, Joyce does not camp at Occupy Santa Rosa but is in support of their goals. "There's no way they can say '97%' instead of '99%,'" says Joyce. "What I do know is that they are embraced by the occupation and that they are a wanted group." At a recent general assembly meeting with about 50 people in attendance, Joyce presented her idea for an End Homelessness Collective to a round of applause from the group. At the same time, it appears that the impassioned but fledgling movement has been ill-equipped to deal with the influx of people into the encampment with issues ranging from bipolar disorder or schizophrenia to drug and alcohol addiction. "I recognize the problems," says Lev Woolf, a graduate of SSU and part-time construction worker who has been camping on and off since the occupation began on Oct. 15, "but the practical point of creating solutions is that these folks need social infrastructure and social institutions that were wiped out by Reagan in the 80's." Woolf says that moving food offsite might be one way to alleviate some of the tensions between those who might need more focused, mental-health assistance and those actively organizing against structural economic inequities. In addition, the approved city camping permit process beginning this week may affect who ends up staying in the camp, Woolf says, adding that he would like to see a general ethic of "personal responsibility" become the norm. Carl Patrick, a 24-year-old Occupy organizer from Santa Rosa, fresh from a three-hour strategy meeting, says that it's important to avoid a divide between "legitimate activists" and the "poor" that are drawn to the camp. "There are lots of folks that are disruptive that are not homeless," Patrick says, "and there are a lot of people here that are participating that are homeless." Patrick adds that everyone who resides at the camp is asked to abide by community agreements, including commitments to nonviolence, no vandalism, no use of drugs or alcohol and no smoking of any kind within the camp. At the same time, some campers may be drawn to the lawn at city hall because of the official rules in place at local shelters. "Some people don't want to go to a shelter," explains Betsy Timm, communications manager at Catholic Charities. In Sonoma County—where the homeless population increased by 25–30 percent in 2010, according to a biennial homeless census—post-traumatic stress syndrome, a desire to be outdoors and substance-abuse issues are the main reasons why people opt not to stay in a shelter, Timm says. "If they've had a really big trauma, they might not be ready." Recently, after several women reported a man with bipolar disorder making suggestive comments, a meeting was called and a group consensus was reached to ask him to leave, explains Patrick. No police were called, and the man left. But during a Sunday afternoon general assembly meeting, the police were called to the site after a scuffle across the street, where many go to smoke away from the city hall grounds. While Occupy Santa Rosa organizers are often inexperienced with security issues, many have said they want to address problems through outreach to mental-health professionals. Carolyn Epple, from Occupy Santa Rosa's mediation committee, says that they are "going to start putting together mental-health training for the security." "We are just not trained for that kind of thing," says Patrick. "But we have to deal with it compassionately. We don't want to deal with it the way the system has dealt with it, like they're trash just to be thrown out."